Movie Review: During the last couple of months I had the chance to watch some movies about the life and work of musicians. From documentaries about Kurt Cobain and Amy Winehouse, to fictional films based on real lives, cases of “Love & Mercy” about Brian Wilson, Mia Hansen-Love’s “Eden”, inspired on the life of the filmmaker’s brother, or the not so satisfying “Danny Collins”, which found its basis on the experiences of the folk singer Steve Tilston. Now’s the time for a biographical documentary film about the singer and civil rights activist, Nina Simone, brought to us by the hand of Liz Garbus (“Love, Marilyn”). 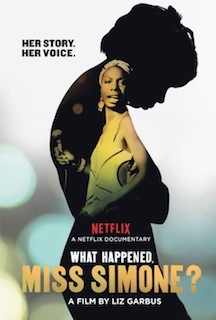 Pulsing with fierce energy and vibrating with the strong presence, both on and off the stage, of Ms. Simone (born Eunice Waymon), “What Happened, Miss Simone?” was treated in the most traditional way, fact that didn’t obfuscate the power and richness of the artist’s life, which speaks by itself. We can feel the anger and the no-fear attitude of Nina, a former Julliard’s classical pianist, whose concerts became a problem at some point due to the insistent and incisive social-political message. Having gone through racial discrimination, the intractable singer who started playing gigs in bars with a fake name so that her mother couldn’t find out, shows her difficult personality, an aggressive, revolutionary posture, and skills as a singer-pianist-composer. Ms. Simone’s daughter, Lisa Simone Kelly, explains to us why her life was a burden since her mother decided to abdicate of being a caring mom to embrace the artist 24/7. Other friends participate by commenting their own experiences with Nina or aspects of her private life, which includes her marriage with the abuser Andrew Stroud, a former cop who became her manager. Garbus managed to put together the essential pieces (archive footage and interviews) in order to create an exhilarating portrait of a lonely, bipolar musician who once affirmed: ‘I’m not nonviolent’.